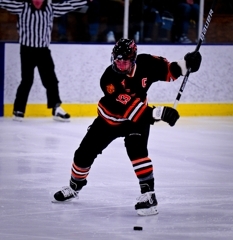 If you were sitting down to Thanksgiving dinner with Delano's Tyler Heinonen and had told him he would score five goals in the first game of the season, he probably would have laughed at you. Heinonen is the one laughing now. 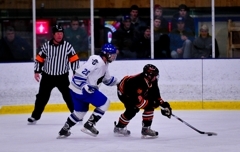 The Delano senior forward was all smiles after a five-goal performance against Owatonna during the seminfinal round of the 2010 Bob Nelson Hockey Tournament, a performance that even he never could have expected. "Not at all,” Heinonen said when asked if he could have ever anticipated his big night. “I came into the game and I was just hoping to get one goal. 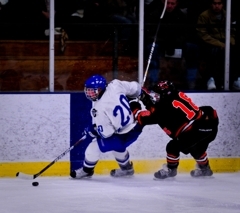 I was a little bit nervous because coming in I scored 44 goals [last year] and not many people expect you to score. Heinonen was right about his statistics, too. He scored 44 goals and also notched 25 assists last season for a total of 69 points. He’s off to a great start for the 2010-2011 season. Heinonen scored twice in the first period – twice within the first two minutes of the first period to be exact – and three times in the second period. 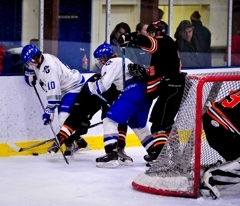 He scored Delano's first four goals and seemed to be constantly driving for more. Heinonen’s play stepped up even more in the third in pursuit of a rare sixth goal. 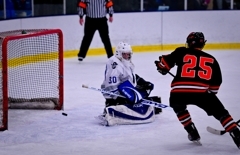 A phenomenal save by Owatonna’s goaltender Sean Hale on a shorthanded breakaway chance as well as saves on several other opportunities kept Heinonen from finding the scoresheet again. It’s safe to say he’ll come to accept his performance for what it was. 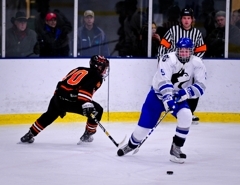 Heinonen played on Team Southwest for the Upper Midwest High School Elite Hockey League this past fall and registered 21 points (12 goals, 9 assists) during the regular season and playoffs. That experience is one that he says has helped make him a better player. “The Elite League is amazing," he said. "The speed of the game is unbelievable. Coming in from that speed to the varsity season which is a little bit slower helped. 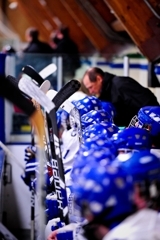 So far, only one college team has taken a serious interest in Heinonen. If this first game is any indication for the rest of the upcoming season, it’s safe to say more interest will come. Stay tuned to the MN Hockey Hub for an upcoming Q and A with Heinonen. This first star is a no-brainer. 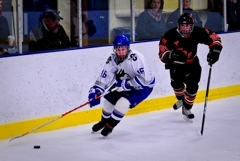 The senior forward scored 5 goals to lead his team past Owatonna. 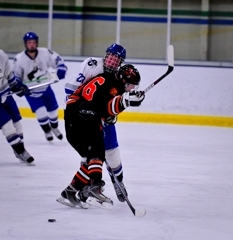 Heinonen registered 21 points during the Upper Midwest High School Elite League for Team Southwest and 69 points last year for the Tigers. 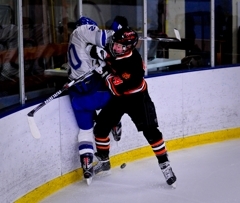 Vatnsdal, a senior defenseman and MN Hockey Hub Super 100 Senior, registed two assists and played solid defense for the Tigers. 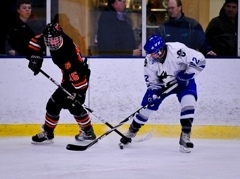 The junior forward notched two assists for the Tigers. 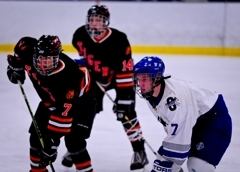 Senior forward Tyler Heinonen scored five goals to lead Delano past Owatonna 7-2 in the first semifinal game of the Bob Nelson Hockey Tournament on Friday, Nov. 26, at The Blake School Ice Arena in Hopkins. 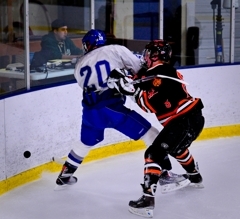 Two of Heinonen's goals came in the first two minutes, and he scored the first four goals for the Tigers. 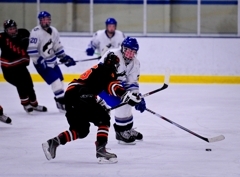 Jack Prinsen and Jake Lorentzen scored the other two goals for Delano, and Jake Breig, Dillon McLain, and Nick Vatnsdal each had two assists. 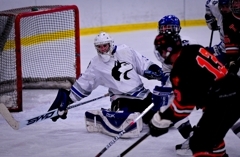 Tigers goaltender Ryan Pinoniemi made 13 saves. 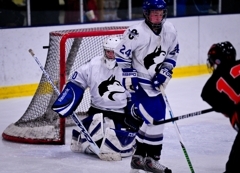 Juan Sanchez and David Feichtinger each scored for Owatonna, and goaltender Sean Hale made 29 saves for the Huskies. Delano advances to Saturday's championship game where it will play Blake at 3 p.m.